Their perception and experience of our grant management processes and reporting requirements. 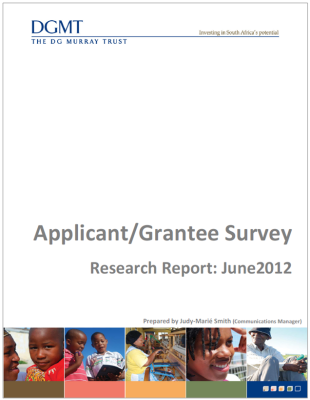 From the outset, we recognised the limitations of user surveys in a situation where grant making is involved. It is indeed difficult to ‘level the playing field’ so that respondents feel comfortable to be entirely frank about their interaction with a funder. We hope that the anonymity of the survey – and ultimately DGMT’s own level of transparency and willingness to learn and change – will convince respondents that we respect their frank appraisal of our performance. As you will see from the report, we received very useful feedback that will allow us to improve our service to NGOs and civil society. We also appreciate and are greatly motivated by the encouraging comments made by some organisations. We would like to sincerely thank all organisations that took the time to participate in the study. You can download and read the report here and you can also look at a snapshot of the most important findings of the study here, although we do recommend that you first read through the report for context. Congratulations for all the incredible work that must have gone into compiling such a valuable research project. In our hectic daily “windmill” of servicing our constituents it was really insightful to see the world from our funders perspective. There is always much learning from all quarters but the report gave the opportunity of seeing how much effort DGMT puts into partnering and communicating with its social partners. Well done!